Pontiac V-8 crankshaft part numbers and specifications 1955-1981. Feel free to contribute. This is a work in progress and not guaranteed to be correct. Pre-1964 cranks must be machined to fit Turbo Hydramatic torque converters. Numbers on the crank are often the same as the part number, but not always. Replacement cranks may be a different part number or casting number than what came in the original engine. Bearings must be installed in the engine and measured prior to grinding the crank to get clearances right. AS = ARMA STEEL = PMI Pearlitic Malleable cast iron. ARMA STEEL logo may not be present on all cranks. ARMA STEEL is not steel, but a form of cast iron. ARMA STEEL was registered trademark #0393916 GM used starting October of 1937. The trademark was last renewed in 1982 and expired in 2002. N = Nodular Cast Iron. "N" mark may not be present on all cranks. CFD = Central Foundry Division. May not be present on all cranks. It appears many cranks do not have a casting date. If they do, it may follow the normal GM format: A=January, B=February and so on. Second digit or digits is date, last digit is year. D124 = April 12, 1964 or 1974. Some cranks may have a 3 digit number like 205. It may be a Julian production date, but I have no confirmation of that. Starting around 1966-1967, not all cranks used with automatic transmissions were machined for a pilot bearing. 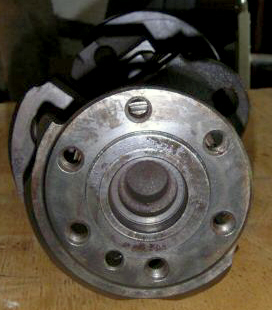 Bearing is slip fit into crank with shield to the outside. The 6202 is available with shields or seals on both sides to keep dirt out. 1969 400 RAIV N 9794054 9795481 N 3.75 3.00 2.25 3.00 2.760 WH, WW, XN, XP engines, 0.001 more clearance.